Should the Rich Pay Even More Taxes? In my last entry, I examined and explained the difference between marginal and effective tax rates. In the midst of the current economic turmoil in the US, and the constant cry from the so-called “99%” I frequently hear that the rich are not paying enough in taxes, and that it’s time they paid their fair share. In learning about the US income tax system and how it works, I ran across several sources of information covering historical tax rates and historical taxes paid. After looking through some of the data and using them to generate some graphs, I’ve come up with a few visual aids to help drive home the following point: The wealthiest Americans ARE paying their fair share, and in the last 30 years the tax burden for all BUT the wealthiest has consistently dropped, while the tax burden for the wealthiest has consistently risen. Quintile: A quintile is 1/5th of the population of what you are measuring. When I talk about the “lowest quintile” or “highest quintile” I’m referring to the lowest or highest 20% of the population measured. Deficit: This is another word for shortage, or spending more than you earn. 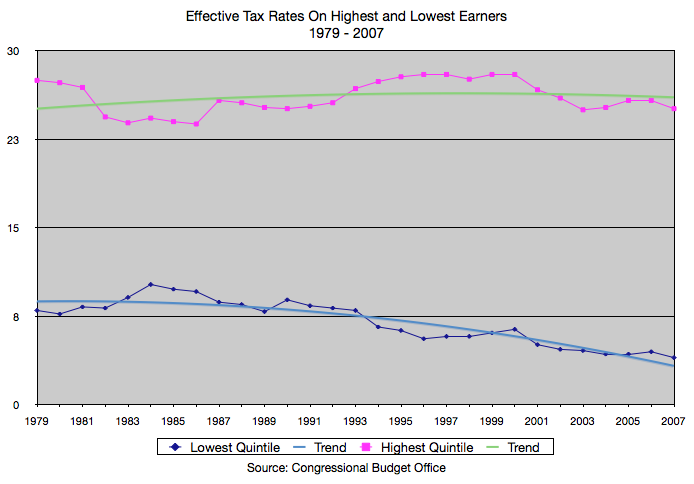 Now, on to the graphs: Up first, a graph of the effective tax rates on the highest and lowest quintile over time. This graph spans from 1979 through 2007 (the newest data available) and clearly shows that while taxes on the top 20% of earners in America has gone up, taxes on the lowest 20% of Americans has declined. The rates on the top 20% have been between 20% and 30%, while the rates on the bottom 20% have moved between 12% and 4%. Also keep in mind that this chart reflects actual taxes paid by these quintiles – after deductions, credits, accountants trying to hide stuff, etc. These are the percentages actually paid in these years. So, to my friends who insist that the rich are paying less taxes, this is exhibit A. To those of you saying “yeah, well the rates may have gone up, but those rich greedy types have found ways to avoid paying more and more!” – well, you guys can check out the next chart. 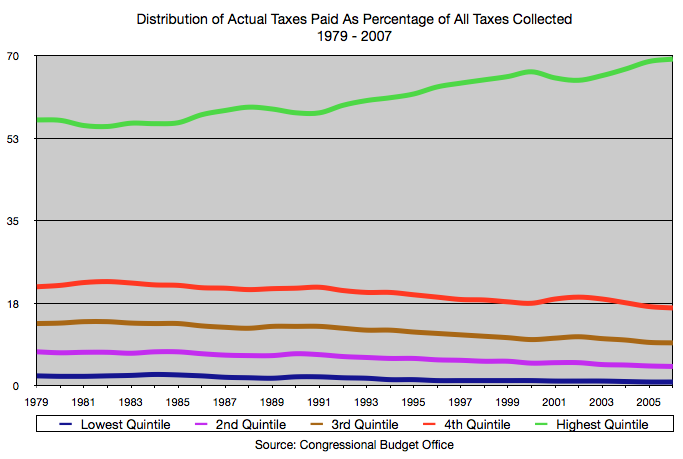 This is a chart of all 5 quintiles of tax payers over the same time period as the previous chart, showing how much of the total percentage of taxes each one paid. In other words, if the US only collected $100 in taxes total, here is who would have to pay how much of the $100. Notice here again that the top quintile of tax payers has had to pay more and more and more (up from just over 50% of all taxes collected to 70%) while the other quintiles pay less and less? So, for 2007 (the last year in the chart) the top 20% of earners paid for 70% of the tax bill to the government, while the other 80% of the US population only paid about 30% of the taxes. 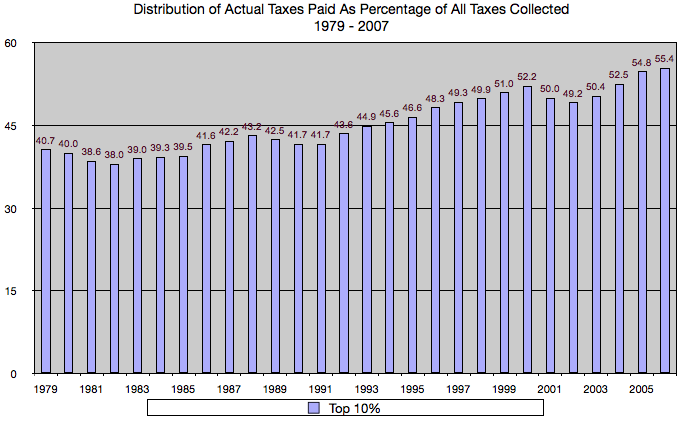 So, in 2007 the top 10% of earners paid 55% of ALL the taxes collected in the US. The other 90% of the population only accounts for 45% of taxes paid. If the trends in this graph continue, the highest incomes will continue to pay more and more of the taxes to fund a burgeoning government filled with more and more social programs and benefits for the lower-income earners. The liberals among you will scream: “Yeah, but they’re RICH! It doesn’t matter to them at all if they have to pay more in taxes – they can afford it! In fact, they need to pay EVEN MORE, and I should have to pay EVEN LESS!” I just can’t understand this mentality… Keep in mind that the above numbers all focus on income, not wealth. By taxing the highest income earners more and more, the obvious effect is that people will be less motivated to earn more – because they just have to pay more of their earnings in taxes. The real problem is not that we are not collecting enough in taxes from the rich, it is that the government is spending WAY more than they are taking in. Even if we raised the taxes significantly on the rich, we would not be able to overcome the huge spending deficit that the government has set up. The rich have been paying their fair share of taxes for years, and have seen that share of tax burden increase over time. It is time to vote in some fiscal conservatives who know how to set and stick to a realistic budget, and who are not afraid to ask some of the rest of us to pay our fair share as well. Very interesting post. Surprising to find that so much of the taxes are paid by the top. I completely agree that it is time for the government to learn to stick to a realistic budget. But when will THEY agree to that? Do your graphs correlate with income over the same time periods? If so, that might support the argument that the rich are getting richer (and of course paying more taxes in total dollars) and the poor are getting poorer (and of course paying fewer taxes in total dollars). The graphs do not indicate changes in income levels across the quintiles, only changes in the percentage of income that is paid as taxes, and the percentage of taxes paid by the members of each quintile. So, even if the rich are getting richer and the poor are getting poorer, the rich are paying a larger and larger percentage of their income as taxes, as the poorer are paying less and less of their income into taxes. Also, keep in mind that those graphs reflect that anyone earning less than about $105k / year is a member of the first 4 quintiles, and has had their percentage of taxes to income fall over the last 30 years. So it’s not just about “rich” and “poor” – it’s about the highest earners and everyone else. We’re gouging the highest incomes already. The graphs clearly show that the rich are paying more total tax. I am trying to see why. Is it because they are earning more (and the poor less), or because they are being taxed more heavily (and the poor less). Also, I agree with each of your conclusions, and I’d like to add that I believe America’s best kept tax secret is that most middle and lower class Americans pay very little federal income tax. This is something I learned in my first few years out of school, when I paid zero federal income tax, despite my strong middle class income. However, my single childless friends paid and continue to pay much more than I (today, a single friend of mine pay 10 times more federal income tax than I, despite very similar incomes).